The Golden Pass train is a scenic train in Switzerland connecting Lucerne in German-speaking Switzerland with Montreux in the French-speaking part. On your journey, you change trains in Interlaken and it is recommended interrupting your travels there for an excursion to a famous mountaintop. Both Mt. Schilthorn and Jungfrau Joch can be reached from Interlaken within 2 hours. Interlaken is located between Lake Thun and Lake Brienz and is considered the gateway to the Bernese Oberland. 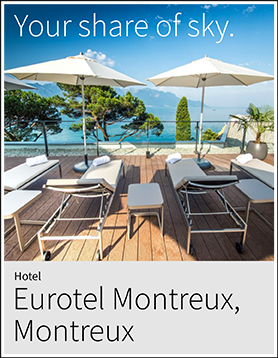 In Montreux, you will see palm trees and experience the southern charm of Switzerland. In Lucerne, you are in the heart of Switzerland and within a short distance of lake and mountains. Switzerland's Golden Pass train will pass along 6 lakes and over 3 mountain passes. Among the most notable are Lake Lucerne, Lake Brienz and Lake Lugano, and the Brünig Pass. Training through along this beautiful part of the Switzerland with the Golden Pass you will also see black fir trees, wild streams, and green meadows with cows grazing and much more. The stretch between Zweisimmen and Montreux is on a historic narrow gauge train and seat reservations are mandatory. Wagons are either modern panoramic or classic Belle Epoque. From Montreux to Zweisimmen you will see the Lavaux vineyards, Lake Geneva and the lovely landscape of the Gruyere and Pays-d’Enhaut with its pre-alpine hills and mountains. This area of Switzerland is precious and best viewed from within a train such as The Golden Pass Train. Between Zweisimmen and Interlaken you will pass by Gstaad and through Saanenland with its rustic chalets. The train will pass along Lake Thun and Interlaken and you will see the Bernese Alps. You will then see Lake Brienz and will climb over the Brünig Pass and along Lake Sarnen and Lake Lungern. Trains between Lucerne and Interlaken and between Interlaken and Zweisimmen are regular trains which do not require a previous seat reservation. The Golden Pass Switzerland is a beautiful experience and a natural way to transfer between Northern and Southern Switzerland. The rail journey is also recommended for families since it makes sense to break it up in Interlaken or if you don’t have time for the Glacier or Bernina Express. The Golden Pass train runs all year around and the entire train between Lucerne and Montreux takes 5 hours 30 minutes. You will change trains in Interlaken and Lucerne, and a few trains require an additional change of trains in Spiez.